We work on what we sell at Super Cycles & Scooters LLC. 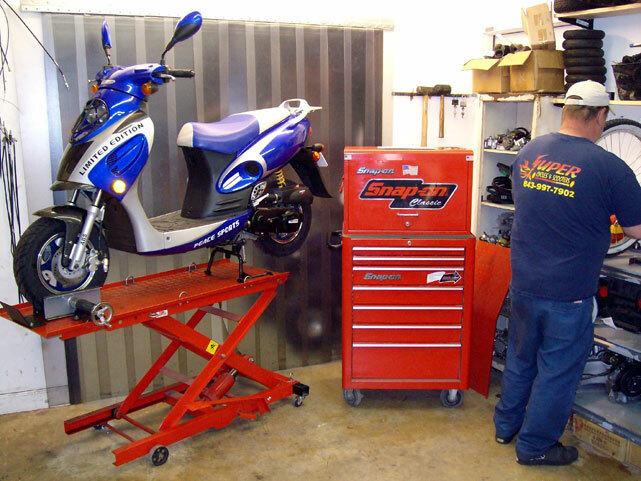 We service and repair Chinese makes of electric scooters, gas scooters, ATVs, and dirt bikes. We do not work on any 2-stroke gas scooters. We give discounts on parts and lower hourly rates on items purchased from us. Rates are listed below. Electric Scooters Purchased from us. *All labor is capped at $35 plus parts at discounted prices. Electric Scooters not purchased from us. * Labor is $35 per hour plus parts. Gas Scooters, ATVs, and Dirt Bikes purchased from us. *Labor is $35 per hour plus parts at discounted prices. Gas Scooters, ATVs, and Dirt Bikes not purchased from us. If you have any questions about our service and repairs. Please call us at 843-997-7902.